We had a wonderful weekend at the beach!! Things have been so crazy so we spent a quiet few days at the Shumway's house in Wells, Maine. The weather wasn't great, but at least we were near the ocean to play. The Hardings were with us for a little while and as you can see.....the kids never cared that the sun didn't come out much. 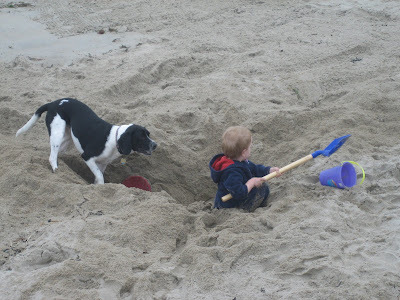 We took walks, cuddled by the fire and DUG, DUG, DUG in the sand for hours!! 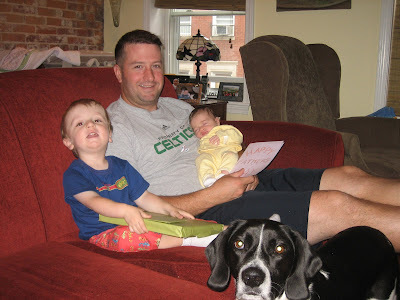 Father's Day 2009 - and Chris now has 2 (or 3 with Regina) kids!! I hope he had a good day. We love him and think he is the best dad in the whole world! Since the weather man said we were going to have another rainy spell we set out to the Franklin Park Zoo before the clouds really set in. It was an early Father's Day trip. And we were lucky enough to have Uncle Matt and Aunt Erin join us. 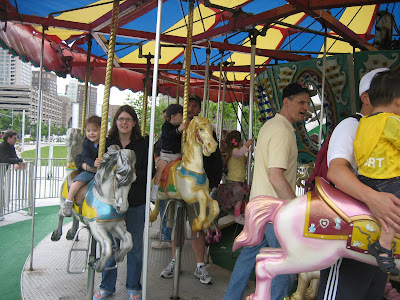 It was a nice day and great to have Uncle Matt there to ride the carousel/etc for us! 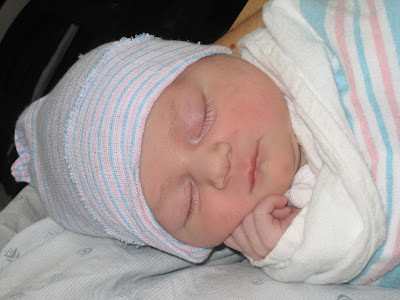 Our little Angela gave us our first scare in the hospital when she didn't pass her state mandated hearing screen. All newborns get this test in the hospital and they said her right ear was fine, but they weren't sure about her left. So they wanted to do a more thorough exam at Mass Eye and Ear Infirmary. UGH!!! 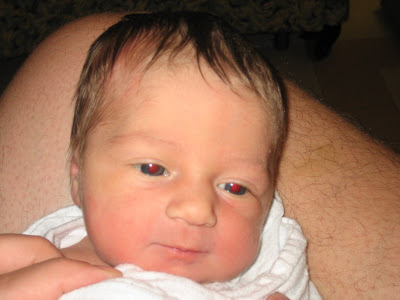 So at 2 weeks old we spent a few hours over at the hospital. After getting probes put all over her head and spending an hour in the sound proof room we know her left ear is fine too!! It was actually pretty easy and she slept the whole time like a champ. I can already see how much more fun Angela is going to have!!! She has a big brother to play with and entertain her. Poor Richie used to have just me to play in his activity mat with. I would sit there and make funny faces and sing songs. 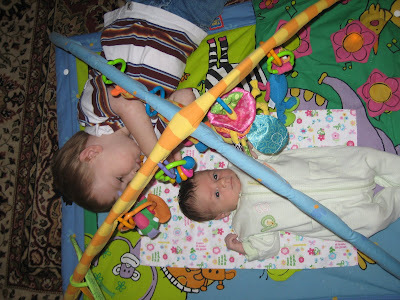 But now, she has a brother who crawls right up under those hanging animals with her!!! Since our anniversary fell so soon after having a new baby it was a quiet one this year. But since Chris and I didn't feel like cooking we decided to try going out to dinner with 2 kids already. It went fine and we had a nice time out. Angela slept the whole time and Richie ate an entire bowl of pasta so he was pretty entertained and quiet too!! Oh, did I mention we went at 5:30 so the restaurant was pretty empty? 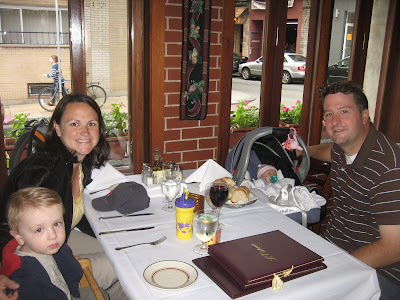 But we learned for next time that you can do a nice Italian dinner out if you go before most people want to eat! 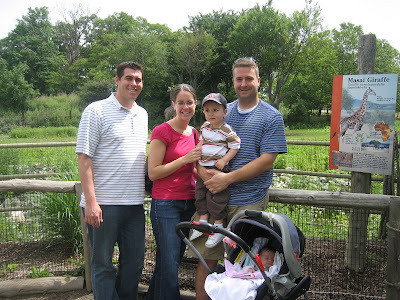 We were lucky enough to have a visit already from Uncle Jim, Aunt Karen, Jakie and Joshua! We had a really fun time riding the carousel, playing in the fountains and checking out the sea lions at the aquarium. Here are some of the first pictures of the big brother. 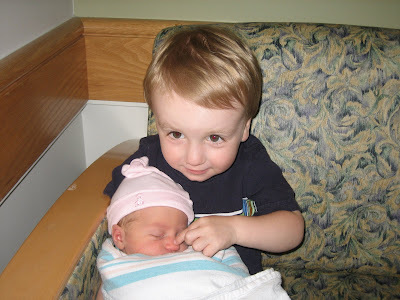 He absolutely loves his new little sister and has been great at being a big brother. He is very helpful and does not seem to be at all jealous. He LOVES when we give her a tub and asks to hold her all the time. Each time he also wants his picture taken! This is the "real" golf club that baby gave him for being a big brother. He also got a "real" hockey stick. Both were things he wanted and hard to come by because he is lefty. The hockey stick actually had to be made for us by our friend Doug.......thanks Doug, you are a life saver! He said it was what he wanted the new baby to bring him and I didn't want to disappoint! Some of our first new family pictures. Looks like we need to get some with Regina! Just some more pictures of our beautiful angel! !